Ever since a young age, I have loved asking questions of causation - I probably annoyed my parents to death with all of the why questions! Growing older, I turned my questions toward my own species as I took on a major of anthropology, concentrating in biological anthropology. The most specific research questions I love to reflect on are about the biological underpinnings of human behavior, specifically with reference to juvenility. Turning a scientific lens to even mundane aspects of human life is an electrifying prospect for me. For example, what social purpose, if any, does playing with others serve humans in the long term? Why do humans especially have such a protracted juvenile and subadult period? The study of primates offers thrillingly interesting insights into these questions and so many more, and I will ideally spend my professional life digging into those queries. that’s how my alarm sounds!comedormore than doubledsiestaFicus mascot for the band Iron Maidenhehas a giant hole in the top of noseeight daysPura vida. Thanks for reading, Dr. Lovejoy! 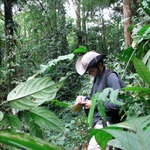 I'm out in the forest every day trying to collect as many data as I can, but sometimes, those monkeys can be SO elusive! Anyway, things are going well, and they're getting better all the time. Thanks so much for the encouragement, Dexter. The days down here are long, and the work is laborious - sometimes for no "monkeyful" reward, so it's great to have some luck sent my way from back home. Before you know it, we'll be sitting somewhere in Kent talking about this project, its difficulties and successes. Cheers, friend. Thanks for the encouragement, Joan! It's really been amazing here at Piro. Rebecca, I haven't actually taken any pictures just yet - which is difficult to believe even as I type these words! Life's been moving so fast since I got here, I haven't really taken my camera out. HOWEVER, there are people who have taken some great pictures while I've been here, and I can see if they'll share those photos with me! More on this before next week's (i.e., Week 3's) post. Thank you, Joan! Give my best to Russ! Thank you so much, Lori! It was a very unexpected but fantastic to see another press release! It was wonderful meeting you, too! I hope I'll get to see more of you in the future. Thanks so much for donating to my research!